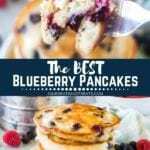 Home » The BEST Blueberry Pancakes! Looking for light, fluffy pancakes with ingredients already in your pantry? This is the Blueberry Pancake recipe for you! Plus, it’s full of juicy blueberries. These pancakes are so easy to whip up for a weekday or weekend morning for the entire family. Top them with warmed syrup and butter then dig into them! 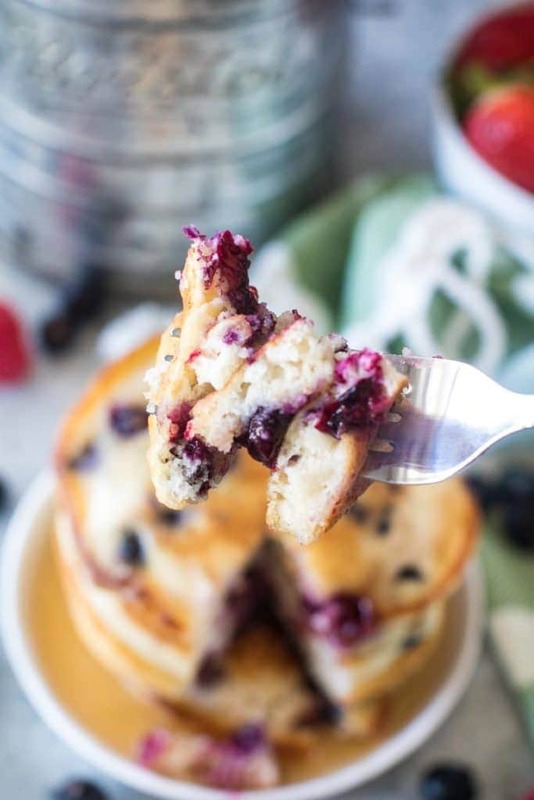 Homemade bluberry pancakes reheat great for a grab and go breakfast when you are in a hurry too! We love our breakfasts here and I know you do too! Whether it’s a quick weekday breakfast or a lazy Saturday pancakes are always a favorite! And don’t even get me started about breakfast for dinner, I can totally wrap my head around that! One of my favorite breakfast recipes is Easy Homemade Pancakes. In fact, for the longest time I used box pancake mix, but once I developed this recipe, that all changed! Pancakes are easy to make and everyone loves them! This time of year Pumpkin Spice Pancakes and Chocolate Chip Pancakes are favorites too! Is your mouth watering yet? It should be! 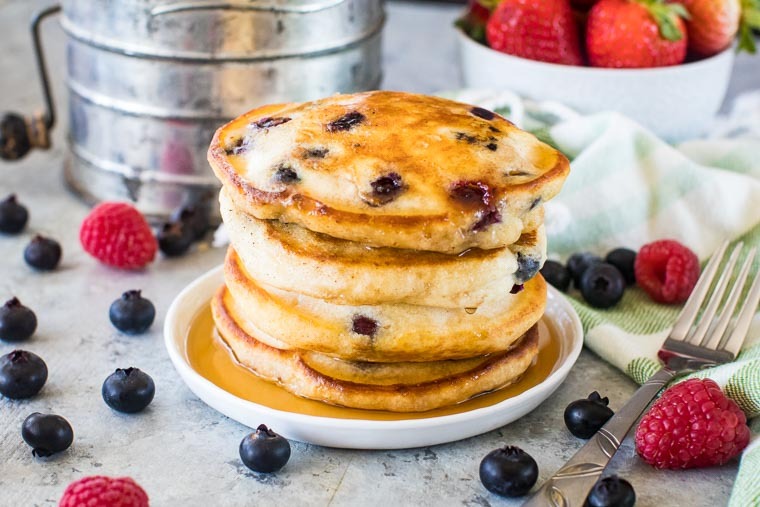 Now I’m featuring this amazing recipe for Homemade Blueberry Pancakes! Sweet, juicy blueberries that burst in your mouth with every forkful – YUM!!! Just like the other recipes, these are light fluffy pancakes and a yummy way to start your day! Are you a blueberry fan? Two of my kids eat them like candy and one kid refused to touch them. I kind of feel like it’s a love or hate type of relationship with them. I hope you LOVE them, so you can enjoy them in these pancakes! Can frozen blueberries be substituted for fresh? 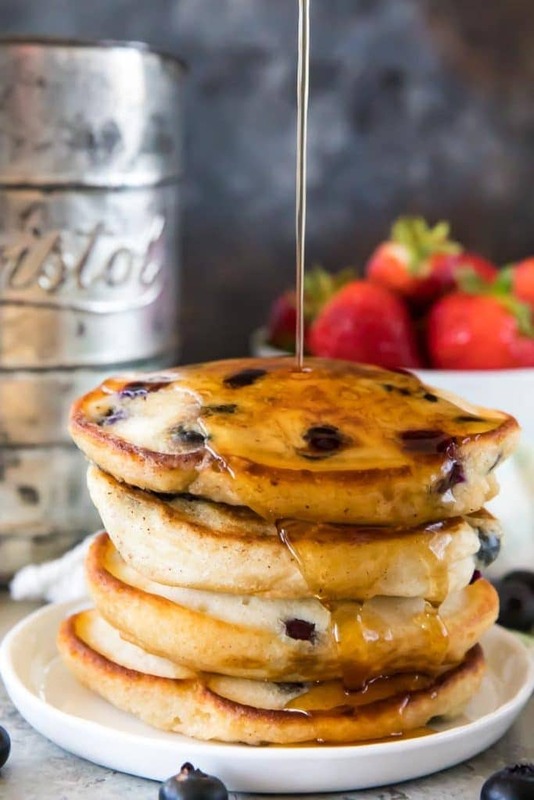 Sure, you can substitute frozen blueberries, however, you’ll want to add the blueberries right to the pancake once you’ve ladled it on the skillet as it’s beginning to cook. If you add it to the batter, they will sink to the bottom. Making blueberry pancakes from scratch is not hard at all! The egg and baking powder makes the pancakes light and fluffy and the perfect easy and affordable meal! How can you tell when a pancake is ready to flip? I think pancakes can be intimidating for some people, but they shouldn’t be! It’s actually really easy to tell when a pancake is ready to be flipped. After you ladle the batter on the grill, the edges begin to brown and bubbles will rise. When the pancake can easily be lifted off the skillet it’s ready to be flipped. Cook the pancake on side two until it’s golden brown and you’ll have the lightest, fluffiest pancakes every time! Sifter – a sifter will help remove the lumps and keep the pancakes light and fluffy! 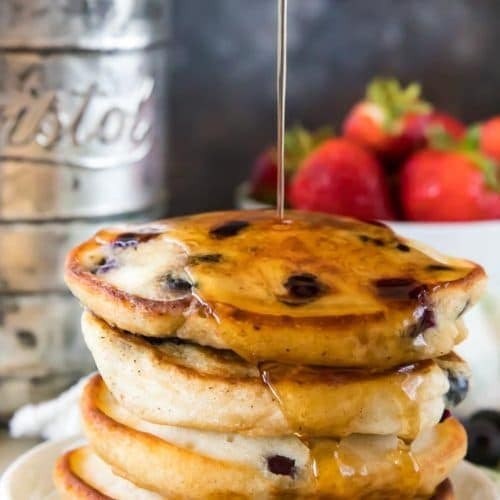 Ladle or 1/4 cup measuring cup – using a ladle or measuring cup will ensure the pancakes are all about the same size, this will help the blueberry pancakes to cook evenly. These pancakes are so easy and have so much flavor they have become a recipe that I always go to when I’m in a pinch and don’t know what to make. We love them for a quick dinner with sausage and eggs too. You don’t need to save them for breakfasts! Combine the dry ingredients and sift into a bowl. In a second bowl beat egg, then add the milk and melted butter. Stir to combine. Combine the dry and wet ingredients and mix until moistened. Gently fold in blueberries. Heat griddle or skillet over medium-low heat. Generous coat with butter. Ladle the batter into the skillet making 3-4 pancakes. Cook pancakes until bubbles form on top. Flip and brown on side two. More delicious pancake recipes to try! Be sure to snap a photo for Instagram and tag me! You can find me at @julieseatsandtreats or just #julieseatsandtreats – that way I’ll get to see how your stack of pancakes turned out! Take a moment and comment below too! I know you’ll love these pancakes and they definitely deserve a five-star rating! Enjoy!!! 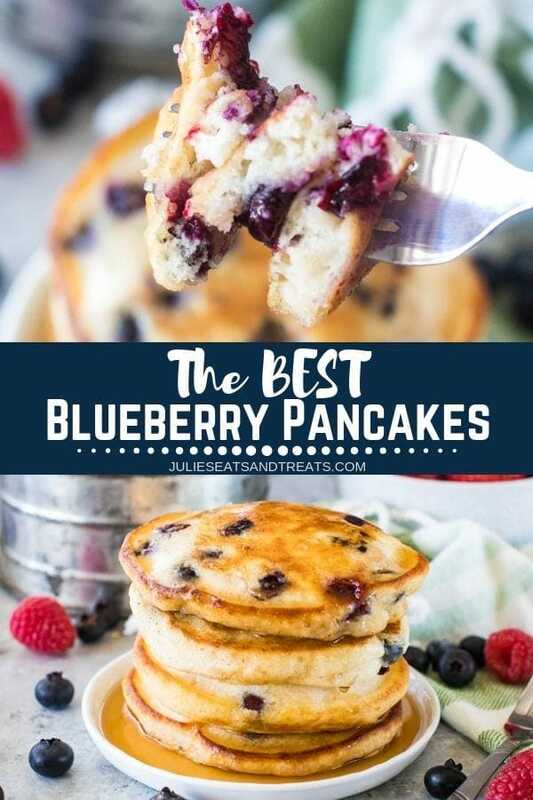 The BEST Blueberry Pancake Recipe! Looking for light, fluffy pancakes with ingredients already in your pantry? This is the Blueberry Pancake recipe for you! Plus, it's full of juicy blueberries. These pancakes are so easy to whip up for a weekday or weekend morning for the entire family. Top them with warmed syrup and butter then dig into them! They reheat great for a grab and go breakfast when you are in a hurry too! Add wet ingredients to dry ingredients and mix until moistened. At this point if it is to thick add the remaining 1/4 c. of milk to the batter a little at a time until you reach the consistency you want. Gently fold in blueberries. Who wouldn’t want to wake up to these delicious pancakes any morning of the week? Yum! I have to tell you, I am not so great when it comes to making pancakes! Yours look so fluffy and thick! I love that! My family all loves pancakes, so I’ll definitely have to give your recipe a try! These are fool proof! You’ve gotta try them! My favorite pancake of all time! I could eat these for every meal! Blueberry pancakes are possibly my most favorite thing in the whole world. Love your directions and the simplicity. thanks for a great recipe. Oh and I love that you use butter to give them that crisp crust. So good! Now I want them for breakfast! Butter is always a good thing, right?! Hands down, blueberry pancakes are my favorite pancakes! These look so fluffy and irresistible!